A question that I find relevant to both my personal practice and my expanded practice is; do varying modes of sustainability and organisational structures effect the output/content of artist and curator led projects? Now two-thirds through our ‘go and see’ funded tour of the UK these questions seem more pertinent than ever. What follows is not a review of the galleries we visited but more an overview of the sector as perceived by us. What constitutes failure or success for an artist run project? What unique pressures do organisations that began life as artist/curator-run projects face as they negotiate their way towards established institutions? Is longevity even desirable? Do the rolling directorships of some or free-association of others mitigate the threat of calcifying institutionalisation? Is an artist /curator run space a stepping stone to other things or a destination in it’s own right? Why do artists and curators start galleries? Four reasons spring to mind. In Gabriele Detterer’s ‘The Spirit and Culture of Artist-Run Spaces’ it’s suggested that historically artist-run spaces arose due to the avant-garde nature of the artists work not being catered for in the commercial mainstream. If the rise of modern art over the past twenty years has shown anything, it’s that a/ the avant-garde will always be assimilated and b/ that assimilation will be coupled by the financial commodification of the artwork. As a promotional tool, a way of rising above the morass of exposure hungry artists that the art schools are pumping into the ‘market’ every year. If established galleries won’t show an artists work – start your own, invite people to exhibit and maybe they’ll reciprocate. Less frequently, some artist-run platforms are created to push a commercial agenda (or at least ACE funded to push a developmental agenda). Commercial success need not be a dirty concept – if coupled by critical success. Critical and commercial success need not be mutually exclusive. Workplace are a stated ‘artist run gallery’ – and this year will be in Frieze. The curatorially run Vane also participates in commercial art fairs, but nobody could accuse these galleries of being conceptually bankrupt. And finally, as a way to reach out beyond the isolation of the studio, geographical location or conceptual position. As Edinburgh based Interview Room 11 say here; they are explicitly looking to use the gallery to build an international network. The desire to connect with like-minded artists, to build a network of ideas, a community of projects. The constant renewal of the rolling committees that run a lot of the prominent spaces in Scotland (as popularised by Transmission) enable a longevity that often doesn’t exist in more fixed founder/director models – where founders moving on generally marks the end of a gallery/project. A corollary to this phenomenon is that it could be said that the constant turnover of committee members can result in the organisation being stuck in a perpetual state of juvenilia. I’m not sure the committee model is best for long term strategising or with the developing and maintaining of inter-organisational networks. On the other hand there are clearly benefits to the committee model, longevity grants elder statesman status – which undoubtedly helps with profile and relationships with local councils, attracting more substantial funding etc. 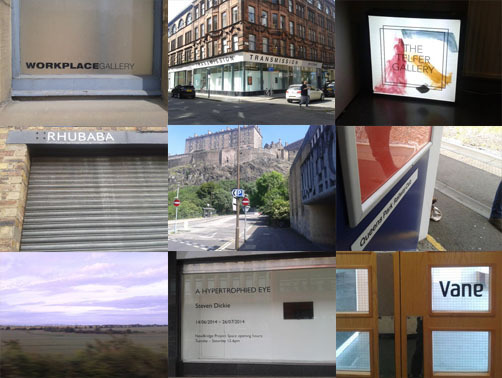 Of the 47 galleries and projects we’ve worked with in the past three years five of them no longer exist. Ten of them operate as pop-up projects; in a sector that’s predominantly non-profit, success or failure is not defined by the market. A gallery can serve its purpose in the space of a few years. Spaces can die or evolve and the protagonists move on to create new projects. Organisational permanence is not necessarily seen as a validator of critical worth. Where the grass-roots are a symbol of an ethical position the sector is not seen as a pathway out but rather as a defiant stance against art as a portfolio investment or plaything for the rich. Part three (and the final installment) will examine the commonalities that binds artist/curator run and non-profit and emerging galleries and projects together. Part three will follow leg three of the a-n Artist Information Company supported Sluice__ tour to Belfast in early September.